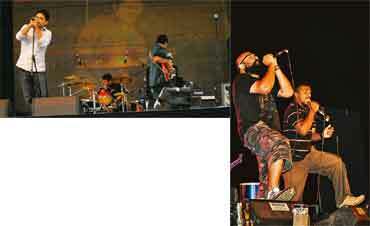 Break the mould: Them Clones (left) and Bhayanak Maut round off an eclectic line-up at the GIR and Eastwind festivals. When the Delhi leg of the 13th annual Great Indian Rock (GIR) festival opens at the Hamsadhwani open-air theatre today, a few new words might enter the vocabulary of the average Indian rock concert goer. Among them is “mathcore", a niche genre of music that grafts “math rock"—or rock music with dissonant, complicated time signatures—with “metal", the combination of thick, heavy distorted guitars and gruff vocals that’s usually the genre of choice at a festival such as GIR. Other arcane words audiences might hear thrown around are “Sludge", “Ragga" and “Progressive", and as far as descriptors for music go, these remain unexplored distinctions in the world of live Indian music, say GIR organizers. “For this edition, we wanted to bring music that’s not been heard live in India before," says Siddhartha Menon, the head of events at music magazine Rock Street Journal, which organizes the event. “We have quite an eclectic international flavour this time, with genres such as post-metal, math-metal—it’s our healthiest line-up yet, with eight new bands who’ve never been featured in GIR." This line-up includes Solstate from New Zealand, who mix elements of electronica with metal, and Norwegian band Benea Reach, who combine our word of the day, “mathcore", with “progressive metal", another subgenre of metal famous for long, elaborate and often meandering compositions. US-band Intronaut incorporates traits from “sludge metal", so termed for the abrasive tonality of its sound. Rounding off the line-up are a number of regulars on the Indian live circuit—Delhi-based Them Clones and Mumbai-based Bhayanak Maut among them. GIR, which kicked off in Pune on Friday, isn’t the only festival trying to bring new sounds to the Indian rock circuit. The Eastwind Music Festival, now in its second year, and scheduled for 29-31 January, is also experimenting with an unconventional line-up. The festival, which describes itself as a “cultural platform for contemporary music", has scheduled international acts from genres as diverse as samba, electronica and straight-up pop. “We want to break the cliché of live rock, and find other genres for our audience," says Adhiraj Mustasi, the founder of the Eastwind Music Festival and Open Sky Production Ltd, the festival’s organizers. “We constituted a strict process and a selection panel to find the best bands. We want to be genre agnostic about the kind of rock music that’s usually played live." Eastwind, says Mustasi, is shooting for a more “festival" atmosphere, not than just a series of shows. “We have multiple stages, a large number of bands spread over two-three days, and other activities centred around music—slideshows, merchandise, maybe even paintball!" For the participating international bands, performing in India is a chance to reach a sizeable niche audience, as well as a chance to discover new musical influences. “When you come from Europe, preparations for a gig in India take a lot of work," says Kevin Storm, rhythm guitarist with Dutch band Cardamon, which is part of the Eastwind line-up. “Not a lot of Indian music reaches us over here, but we can’t wait to meet some of the bands that will be performing with us on the festival. And there are some seriously talented rock musicians in India." The Great Indian Rock festival will be held at the Hamsadhwani open-air theatre, Pragati Maidan, New Delhi, on 24-25 October; the Palace Grounds, Bangalore, on 25 October; and Nicco Park and Someplace Else, Kolkata, on 24 October. Passes are available at the venues. Click here for detailed schedules.